That cartoon is er…. perfect? Mo talking about god sounds a lot like trump talking about himself…. sorry you guys in the UK and worldwide have to deal with him…. Look out Jesus! That bird is coming straight for us. That’s not a bird, Mo….. it’s a bat. 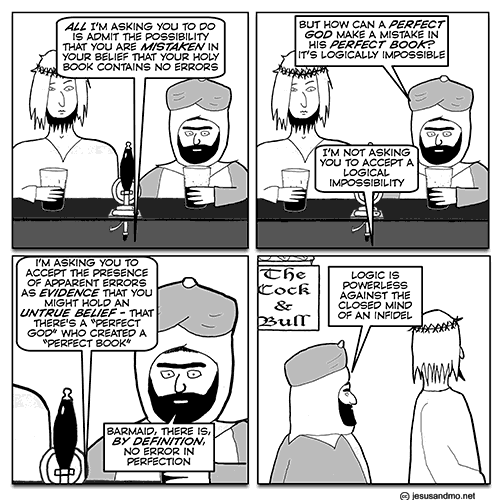 As I recall, when someone points out the presence of apparent errors in a supposedly perfect book created by a perfect god, the usual response by religious folk is that the “errors” are there to test one’s faith. The points in question may appear to be errors from the human point of view, but from the divine point of view, they are not errors at all. Etc. A rigorous religious education gives a person the ability to rationalize (spin) almost anything. Beautiful, yet again, Author. Bravo. I have come to believe the theory that we developed brains capable of logic not to find truth but to support our beliefs in discussions with other humans. When I think about it, that’s a much more practical use for logic and reason than any attempt to understand reality. Makes sense that it would be the reason behind our brains evolving to support the capacity. There is survival value in winning arguments or persuading others. There are plenty of sincere religious believers who are perfectly willing to acknowledge at least the possibility that they might be wrong. In fact I suspect that at least among Christians in the West they are a majority. The Catholic Church certainly doesn’t teach that the Bible is inerrant, and a lot of Protestant sects don’t either. It’s just that the hard-liners are really good at sucking up all the attention. DH — yes, agree totally! Convert? Nah…I’m too attached to my foreskin and I’m never giving up beer and bacon butties….The barmaid needs to offer pork scratchings to them both at every opportunity….They would soon see the error of their ways…. And to plan attacks and defend from attacks from the tribe adjoining. Huntergathers need large territories. Yes, but I think Harry Krishna is the correct religion. Yes, but I think Hurry Krishna is the correct religion. Pork is an half of the idea. But offering mammalian meat on fridays would also be nice. A nice juicy steak on a Friday. Another reason to bin bronze age lunacy. Washed down with a nice bottle of real ale. OK, forbidden meats? Let’s talk about cannibalism! Bible contains several references. Of course Jesus says come on and eat my flesh, but mostly the cannibalism happens in the context of prophesies about what’s going to happen to people (like us) who have been defying Yahweh, eating friends and relatives to satisfy urgent caloric needs. Presumably regrettable. Traditional cannibalism, where for example the Israelites might have done battle with some other tribe and brought back a few carcasses, isn’t discussed. I thought the bible was the basis for morality? It’s kind of perplexing to see a hole like this in the teaching, so maybe I missed something. Or the bible isn’t perfect. Donn: I don’t think you missed anything. All one has to do is consider where the bible came from, how it came into being, how it is printed and distributed today. What are the chances that such a book could be perfect? Zero. When fundies tell me that the bible is the perfect word of god, I ask them what about the possibility that some crazed atheist infiltrated the publishing house and altered the text in subtle ways. How would they know? Or forget about crazed atheists, how about religious leaders with an agenda? There’s no denying that the physical book as it exists today is a product of man, of print shops and factories. How can you trust that such a book survived the process of printing and still remains perfect? Well, I suppose you could take it on faith, eh. Perfection is in the eye of the beholder. 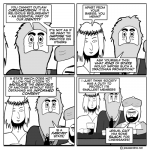 As two-cents points out above, they have a dodge for this: you can’t follow god’s reasoning, so you can’t judge whether god managed to get a perfect copy into the hands of the right people. You just have to take their word for it, those right people who can’t steer you wrong (your faith assures you.) If a crazed atheist was allowed by the omnipotent to alter anything, that’s part of the fabric god’s weaving. 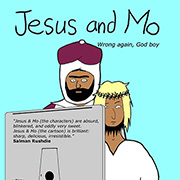 Really Mo has it exactly right – if you’re going to have a god, it has to be perfect, and if it’s supposed to communicate with you through a text, that text has to be perfect. The only way out is to counter that the 2nd premise is false – we aren’t to take the text as literally true – which makes a good deal of sense, given that we couldn’t reasonably subject god’s communications to that standard, without being able to understand god. All depends on “faith”, i.e., absurd belief structure whose acceptance defines religion. Gee, Mo … projecting much?